Moving out of your college dorm or apartment is easier than ever! Forget carrying boxes up and down multiple flights of stairs or maneuvering through busy hallways crammed with hundreds of others students. ZippyU takes the work out of moving and lets you enjoy your last few moments at school without the hard work and stress of moving on your mind. Zippy Shell is a leading moving and storage company that homeowners have used for years when moving from one house to another. Now, students can utilize the services that are tweaked to meet their unique needs. Offering a quick, easy and affordable solution to your student storage needs, ZippyU Student Storage makes exiting the school year as painless as possible. And it’s way easier than dragging all that stuff home for the summer. So how does it work? A few weeks before the end of the semester, simply call ZippyU Student Storage to set up a pick-up time. We will tell you when and where you can pick up your complete packing supply kit (or we can mail it to you for an additional fee). Once you have your packing materials in hand, take your time boxing up your belongings (be sure to follow the instructions), and wait for the big day to arrive. On your scheduled pick-up day, the ZippyU crew will arrive at your dorm or apartment and take away all of your belongings. While everyone else is scuttling around trying to grab rolling carts, convincing family and friends to lend a hand and throwing away stuff they’ll need in the fall because it won’t fit in their vehicles, you will be sitting back watching all the chaos with a cup of coffee in hand. Meanwhile, your stuff will be safely on its way to a climate-controlled storage facility. When it’s time to move back in, our crew will bring back your stuff and put it safely where it belongs. Yep, that’s right – you don’t have to lift a finger to help because we do all of the work! ZippyU Makes Move-In Day Fast And Easy! 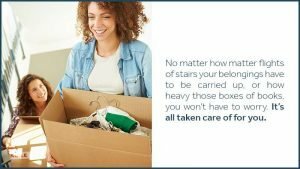 No matter how many flights of stairs your belongings have to be carried up, or how heavy those boxes of books, you won’t have to worry. It’s all taken care of for you. With several different storage packages to choose from, and prices as low as 20 percent below our competitors, this unique service is a real deal – even for a strapped college student! Professors too may want to take advantage of our service geared toward their specific needs. To find out more about how the ZippyU Student Storage Service works, simply log onto our website at www.zippyu.com for all the details or contact us at Zippy Shell Greater Columbusfor assistance.